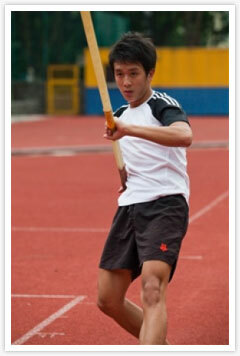 He’s just 17-years-old, but Hwa Chong Institution student Sean Lim Zi Qing became the fourth Team Singapore athlete to qualify for SEA Games 2011 with his excellent recent pole vault performance at the 37th Singapore Junior Athletic Championships 2011 held on 5 & 6 March, at Bishan Stadium. The Asian Youth Games 2009 bronze medalist matched the 2009 SEA Games bronze 4.50 meter height on his second attempt with ease, after starting out on 4.10 meter pole vault height with no issues. When he raised the bar to 4.67 meters; that’s one centimeters more than the current men’s pole vault record; Sean Lim successfully got his body over and around the bar, however it seems his thighs had a slight contact and snagged the bar as he was on the way down. The young pole vaulter is on a trail-blazing course through the local men’s pole vault ranks, for which he holds the records stretching from the Under-16 (4.23m, 2008), youth, to junior level (4.61m, 2009). An excellent prospect for the future, Sean Lim shared that he’s now focusing on attaining a new personal bests now that he has the SEA Games qualification out of the way. Q) What are your thoughts and feelings after your 4.50m effort at National Juniors which sealed your place as the fourth Team Singapore athlete to qualify for the SEA Games. Sean Lim: I was elated as it has been awhile since it was a good opening height to start the year with. I didn’t think too much when attempting the height and just listened to my coach’s instructions so it came as a surprised when I did cross it. Q) While attempting for the record of 4.67m, you nearly cleared the bar, but it seems while during the clearance, part of your body hit the bar. What happened? Are you confident of breaking the national record? Sean Lim: It was quite close. I was unable to consolidate my thoughts to execute a ideal jump as I had many aspects of the jump to focus on. Yup, if all goes well, yes, I’m hoping to break the pole vault national record of 4.66 meters soon. Sean Lim at the recent National Juniors 2011 meet, where he equaled the SEA Games men’s pole vault bronze mark of 4.50 meters, and sealed his spot in the SEA Games squad. Q) So with SEA Games qualification out of the way, what’s next for you? Sean Lim: The national record would be the first step. My coach has my training plan and goals all planned out so I don’t have to worry much and focus on training and studies. I’m also gunning for results at the upcoming ASEAN school games which will be held in Singapore this year. Q) Will your end-of-the-year school exams clash with SEA Games? Sean Lim: I’m currently studying in Hwa Chong Institution. I’m not sure if my exams will clash, but hopefully not! Q) How supportive is your school & family in your pole vault endeavors? Sean Lim: My family and friends are all very supportive of my pursuit for excellence in pole vault. I believe such support is important for an athlete’s development and progress. Q) Any tips for student athletes on juggling studies and training/competition? Sean Lim: I cannot emphasize how important time management and self discipline are. There is a lot that has to be sacrificed to ensure that I am able to excel in both training and studies, with neither to be compromised. 30 June 2009: Sean Lim won Singapore’s first Asian Youth Games bronze medal at Pole Vault. Video courtesy of singapore2010 Why?OhGee! Image courtesy of Team Singapore.